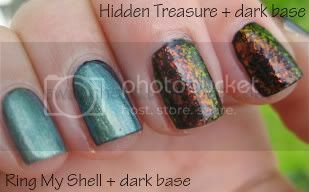 Like so many others, I read about Sally Hansen Hidden Treasure and decided to go on a hunt for it. Luckily I was able to track one down, so I picked it up along with a couple of others from the summer collection. Most of the colors in the collection weren't too terribly unique, being reminiscent of the stereotypical "tropical" colors: berry pink, turquoise, yellow, etc. I chose Pomegranate, Ring My Shell, and Hidden Treasure as being the most unique colors of the bunch. I also picked up Yellow Kitty, which is part of the regular collection, mostly for it's name, of course! Swatches and my review after the jump! The formula on these is pretty decent, although I did experience some "balding" with Yellow Kitty when I added additional coats. 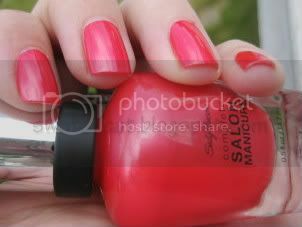 Pomegranate was opaque in just two coats! 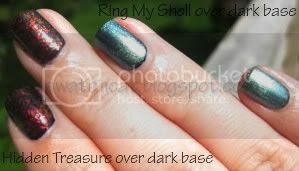 I thought Ring My Shell would be a really pretty, sheer layer to add over dark polish for extra sparkle, like Hidden Treasure. But, it falls somewhere between sheer and medium coverage. I was pretty disappointed. I suppose Ring My Shell would be a great color to layer over a french manicure without totally covering it, but I really don't see myself using it on its own. Ring My Shell is destined for my frankening pile. Hidden Treasure, ohhhh Hidden Treasure! It truly does not disappoint. Over dark polish it just looks like fire! 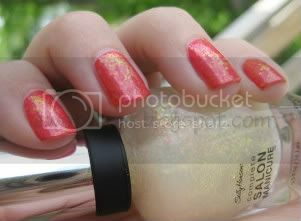 I topped Pomegranate with Hidden Treasure, and it just looked like the perfect summer manicure. Bold, bright color, with a little sparkle and flash in the sun. Definitely my favorite combination so far. 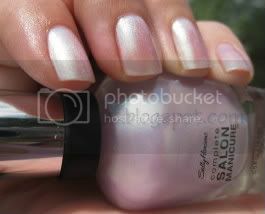 I'd also like to mention the brush on the Salon polishes. I really like it! It's flat with a slightly rounded tip. It takes a few strokes to get used to it, but it's so easy to maneuver at the bottom of the nail bed. Hidden Treasure & Ring My Shell over a deep purple base (pointer & ring) and a black base (middle & pinky) See the red flash over the purple base?! Pretty!! 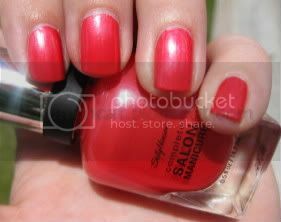 Pomegranate - the perfect summer color! Check out the pink flash! Pomegranate + Hidden Treasure - didn't think Pomegranate could get any better? It just did. And here is swatchcat D directing the swatch session. For drugstore polishes, they are a bit expensive. But plenty of drugstores offer variations of buy one, get one, bringing the price point down. I probably would purchase these again, especially if more colors like Hidden Treasure are released. 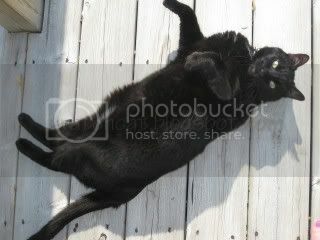 Overall, I give these 3.5 paws up.